There are two related types of melanin, dark melanin (black or brown) and light melanin (tan or reddish). In the hair, melanin is found in minute pigment granules. The genetics of coat color is largely concerned with the genes that affect the number, shape, arrangement or position of these granules, or the type of melanin they contain. In poodles, the most common color is black. However, there is no black gene, but rather a number of genes that work together to produce black. The first event that could be altered is the correct specification of cells in the neural crest. If the subpopulation that would normally give rise to melanocytes never forms, the result would be an animal without pigmentation in the skin or hair. However, mutations affecting this process generally affect other neural crest derivatives and are lethal. To my knowledge, there are no known mutants of this type in the poodle. Dogs homozygous for Irish spotting have irregular white patches. The number and size of these patches is extremely variable. This is probably the allele that produces mismarks. The extreme white piebald allele is thought to be responsible for all-white animals in some breeds, but not in the poodle. One thing almost universally agreed upon by geneticists is that true albinos, lacking all melanin-based pigments, result from a deficiency in the enzyme tyrosinase. Albinos are homozygous for the recessive mutant allele c. CC or Cc dogs have full color, as determined by the other genes carried. Albinos (cc) have no pigment in the nose, eyes, hair or skin - and are very rare. In many mammals, there is a third allele, chinchilla (cch). In mice, this allele produces defective tyrosinase which cannot synthesize the normal amounts of melanin. For some reason, the melanin that is made is primarily the dark eumelanin. The degree to which the coat is lightened depends on the species. The eyes and nose generally remain dark. In dogs, most authorities classify a chinchilla-like mutation as an allele in the C series, but I have seen no studies establishing that it directly affects the activity of tyrosinase. Chinchilla is said to have no noticeable effect on eumelanin, but reduces the color to cream in dogs that would otherwise be tan, apricot or yellow (golden). If this is correct, then a black or brown poodle should be unaffected, but a "chinchilla-apricot" (cchcchee) would be cream. However, I can't help wondering whether the chinchilla allele may account for so-called "bad" blacks. A dog carrying both an A (agouti) and an E (extension) allele will have the dark melanin (as both are dominant, only one copy of each is necessary), whereas a dog that is either aa or ee will have the lighter melanin. Generally, when all breeds are considered, aa more often produces yellowish-tan and ee the more reddish tones. Apricot poodles likely fall into the second group. Though Willis says that the at allele (black and tan bicolor) is found in the poodle, it is certainly rare, and would be a fault. These genes do not affect the synthesis of melanin, but rather the structure and organization of the pigment granules. The B gene (brown) determines whether the dark melanin-containing granules appear black (BB or Bb) or brown (bb). A true brown must have no black pigment anywhere including the eyes and nose. The D (dilute) gene affects the apparent intensity of the pigmentation, but not through an actual reduction in the amount of melanin present. There are two alleles described in the literature, D, which is dominant and gives full color, and d, which leads to a clumping of the pigment granules in a homozygous (dd) animal. This leads to reduced light absorption. In an otherwise black animal, the d allele is supposed to produce a "Maltese" blue (slate grey) animal, and possibly cafe-au-lait when acting on a brown. Confusion between the effects of this gene and that of the greying and silvering genes (see below) is common. The Maltese blues are said to be born blue. However, these seem to be much less common than the silver-blues, at least among the Standard poodles. Red poodles are rare, generally appear in apricot lines, and appear to be the result of a separate gene. Willis, citing Robinson, talks about "rufus"genes, that are poorly characterized, but may act to darken an apricot or brown coat. As the poodle pedigrees for reds suggest only one such gene, I propose that it be called F (rufus; R is already used for roan). The recessive allele, f, produces red in an apricot (i.e. eeff), and may also affect brown, but is supposed to have no effect on black. Most authorities describe a dominant allele (G) for graying; non-grey would be gg. Some also consider it to be the gene for silver, in which case it would have to be a partial dominant. Willis (1989), however, says that silvers are dilute greys (ddG); he does not indicate whether ddGG and ddGg would be the same. Searle (1968) says simply that "this dominant gene apparently leads to a progressive greying in coat-color throughout life and seems to be present in poodles." The greying gene, in contrast, leads to a gradual accumulation of silver-grey hairs in the coat, generally beginning around 4-5 years of age, much as in humans. The dam of one of my own poodles (a black Mini) is two years younger than the sire, but looks older as she is turning grey and he is holding his color. However, creams are also obtained in crosses between two blacks, often at close to the expected 1/4 for a recessive trait, and with no other colors than black and cream appearing. These cannot be silvered apricots, as at least one of the parents would have to be blue, and both blue and apricot progeny would be expected in addition to black and cream. There are two genetic mechansims by which dogs can be reddish in coat color. The first one is inherited as a recessive, "e/e" at the E locus which is the MC1R gene. This is the yellow of Labrador Retrievers and also the red of Irish Setters, so the shade can vary tremendously. "e/e" dogs are "clear red" without a single black hair or even whisker. Some Poodles are e/e at MC1R and in the case of these dogs, one can not predict their K genotype. Such e/e dogs could be KB/KB or KB/ky and still not be black since the e/e genoytpe prevents black pigmentation of hairs in dogs (but not nose leather or pads). 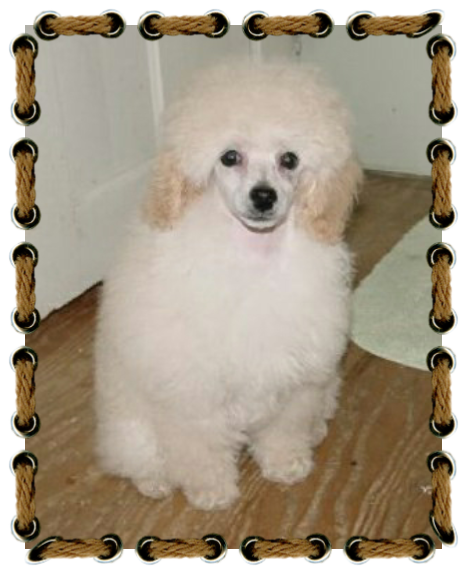 Poodles that are e/e are often cream or apricot, such as Molly. Such paler shades of red are caused by another, as yet unidentified gene. The other form of red is "fawn red", called "sable" in a few breeds of dogs, such as Shetland Sheep Dogs. This fawn red is caused the the dominant allele "ay" at the agouti or A locus. This form of red also occurs in the Poodle. Some dogs have black whiskers or some black hairs intermingled in their coat, but not all with this genotype have black hairs. 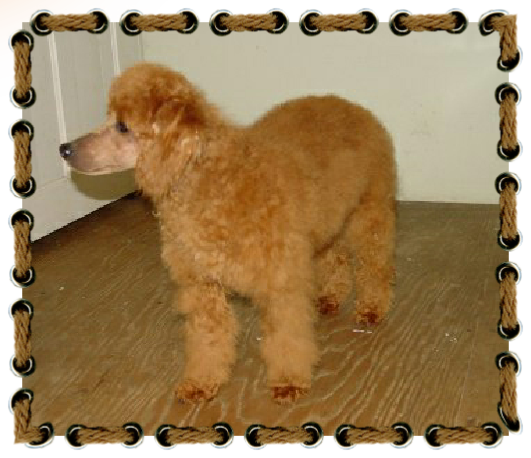 Shay is an example of a red Poodle that is caused by "ay" that does not have any black hairs but did have hints of black tips on her hairs as a pup. This type of red seems to be more common in small Poodles and necessitates a ky/ky genotype as well as an ay allele.